Comic-book writer Carey (installments of Hellblazer, X-Men and Ultimate Fantastic Four are among his credits) pens his first novel (released in the U.K. in 2006), a funny, frightening, thoroughly absorbing thriller set in an alternative London where ghosts and other supernatural things go bump in the night—and day. Felix Castor, reluctant magician and exorcist, lives with his long-time friend, Pen, in her ancestral family home. Castor is burdened by the unwitting exorcism-gone-wrong that placed a close friend in a mental institution. Flushed with guilt over his failure, Castor no longer has his heart in the exorcism business. But when Pen confides she needs money soon or will lose her home, Castor reluctantly takes a commission to rid an enormous government archive of an odd ghost—a woman whose face is partially obscured by a red mist. Castor receives a warning against taking the case, but what does an exorcist really fear? Certainly not the ghost haunting the archive, nor the sleazy owner of a house of prostitution who tries to make Castor an offer he can't refuse, and keeps as his henchman an enormous and vicious lope-garou (werewolf) that would like nothing better than to take a bite out of Castor. 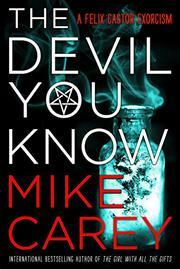 Carey's writing is nimble and witty, his dialogue believable. The exorcist's sardonic observations and personal sense of tragedy make him an unlikely, likable hero. There is tons of action and an interesting assortment of characters and creatures that will make readers want to sleep with one eye open. American readers may feel somewhat hindered by the British expressions and references to London geography, including underground stations and streets, but those who buy into the premise of the British capital being overrun by ghosts and demons will find this to be one wild ride. Carey transcends his comic roots in this quirky, dark and imaginative tale that compels readers to keep turning pages long after they should have gotten to sleep.